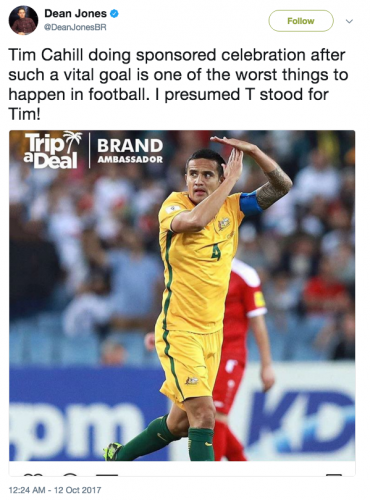 Socceroo star and perennial goal scorer, Tim Cahill, surprised fans at Tuesday’s world cup qualifier against Syria when he ditched his famous post-goal celebration – boxing the corner flag – for a “T” hand gesture and an impersonation of a plane. However, it’s now been revealed the “T” and the plane were apparently a plug for one of his sponsors, online travel site Trip A Deal. Although few would have known it had it not been pointed out. Cahill responded to the Trip A Deal post with a number of emojis, however the post has since been deleted. Cahill also plugged the travel firm post-match on his own social media. It’s now been suggested that the post-goal gestures may have been inked into Cahill’s sponsorship contracts. It has also been reported that Cahill will not be sanctioned by his bosses, Football Federation Australia, for the post-goal stunt. The Cahill incident highlights sports’ growing concern of players plugging sponsors during game. In 2016, Super Bowl star, Peyton Manning, used a post-game speech to spruik one of his sponsors, Budweiser, and a restaurant chain, Papa John’s, that he part-owned. “I’m going to drink a lot of Budweiser,” Manning said post-match. His comments were reported to be worth $US3.2 million in free advertising to the brewer alone.